"Hristofor Bunardzhiev" Foundation supports the children's festifal "Like the stars"
Home › NEWS › "Hristofor Bunardzhiev" Foundation supports the children's festifal "Like the stars"
The non-profit organization "Encouragement and support of children's talent - Vega" in the face of Europe's only traveling children's festival "Like the Stars" managed to awaken the love of folklore in the young generation, music leaders and social institutions. During its 17 years of existence, the association has completed over 3,050 performances, 203 television broadcasts and 254 addresses of gratitude from municipal, regional and social institutions. In the last six years they have also organized six national festivals specifically aimed at children from social institutions. The national festival in 2016, which was under the patronage of the Vice President of the Republic of Bulgaria, Mrs. Margarita Popova, gathered more than 250 children from all over Bulgaria. 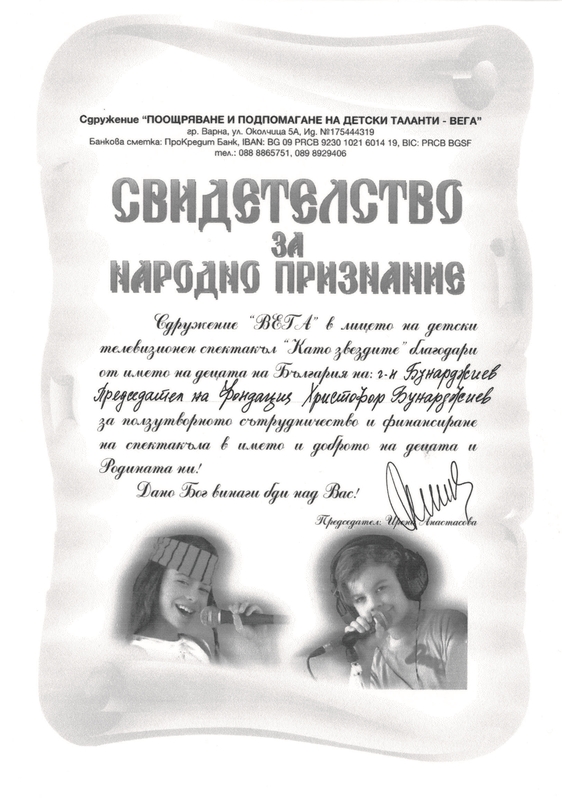 Since the promotion of children's talent is among the main priorities of the "Hristofor Bunardzhiev" Foundation, the manager of the Foundation and CEO of Bulagro Group - Mr. Bunardzhiev gladly accepted the idea to help organize the seventh national festival "Like the Stars" for children from social institutions. It is going to be held on 19.05.2017 at 13:30 pm. on the square in the city of Muglizh.